GPU Caps Viewer is a utility for graphics card that specializes on Open GL information. It does provide a general overview of the video card. The usual information are displayed in that tab like the video renderer, the version of the drivers, Bios and even the device id of the graphic card. 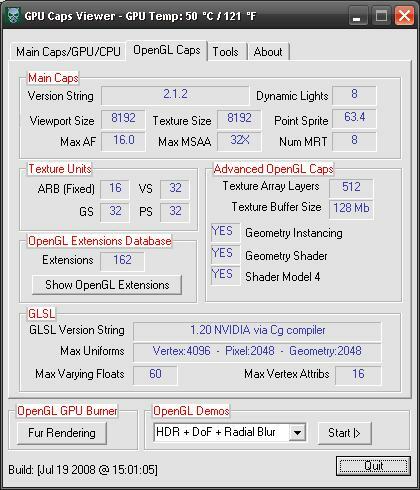 More interesting is the Open GL Caps tab which provides extensive information about Open GL capabilities of the video card among them the OpenGL version, texture size and number of texture units. The same tab lists the Open GL Extensions that are supported by the video card. The core temperature of the video card is always displayed in the title bar of the software and several stress test demos and one named Open GL Burner are provided to stress test the video card. It's possible to start multiple demos at once to put lots of strain on the video card to see how it handles the load. The data can be exported in XML format. Another nice feature of GPU Caps Viewer is a links section that provides links to the latest drivers and information about the video card. GPU Caps Viewer 1.6.0 is available. GPU Caps Viewer has been updated with ForceWare 178.15 and Catalyst 8.10. Driver detection has been improved and geometry instancing (want to see 8,000,000 polygons rendered in real time?) as well as Vertex Displacement Mapping demos now support Radeon graphics cards.